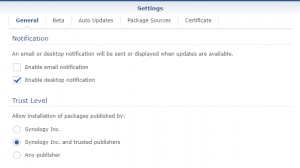 I am going to add a feature in my own version of SSPKS to sign Synology packages. But to do this, I need a way to create GPG key from a non-interactive script. not require a passphrase as mentioned in the Synology documentation. This would break the build process. Obviously, you need gpg. I am using gpg2 made available by installing the package gpgme via ipkg as explained here. First, put the parameters to be used by gpg into a file named 'gpgKey' (don't forget that it must be linux compliant => not CRLF (/r/n) but only LF (/n)*). Here under, I am using RSA 2048. Use your own name, comment and email address. (dd if=/dev/zero of=/dev/null) & pid=$! gpg: RSA/SHA1 signature from: "1418FFE0 [?]" gpg: RSA/SHA1 signature from: "71C22B00 [?]" *: the trick to replace all CRLF by LF is to edit the file with notepad++, use the menu Encoding > Convert to UTF-8, and next do CTRL-H to search and replace /r/n with /n using the search mode = Extended. You can finally check that there is no more CRLF by using the menu View > Show Symbol > Show End of Line. 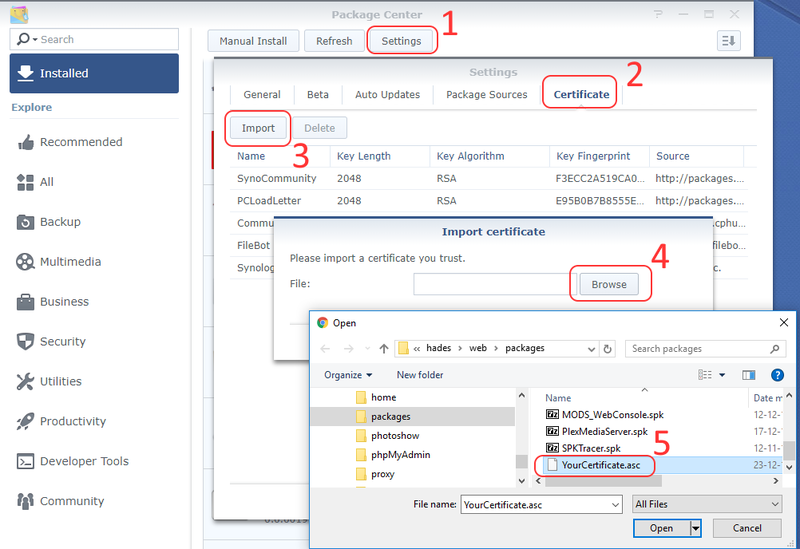 This file 'gpgkey.asc' must be copied in the root folder of your SSPKS server, so it will automatically be added as a trusted publisher for anyone who is adding your SSPKS url in his list of "Package Sources". Once the script createGpgKey.sh executed, you will find two files pubring.gpg and secring.gpg in the folder gpg (created by the script that run in /var/services/temp/). gpg: RSA/SHA1 signature from: "F93A0789 [?]" gpg: RSA/SHA1 signature from: "8AAC41CF [?]" 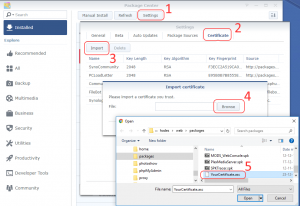 Since a long time, I was waiting to have enough free time to investigate how to sign my own packages with Synology's toolkit. It's now finally done! First, install IPKG as explained here. Next, install the official Synology package "python3"
Now, install GIT as explained here. There was not enough free space in the system partition to install the toolkit!! NB: the platform must be in lower case !!! And do not type any passphrase. Just press 'Enter' without typing any character until it accepts to not make your key secure. 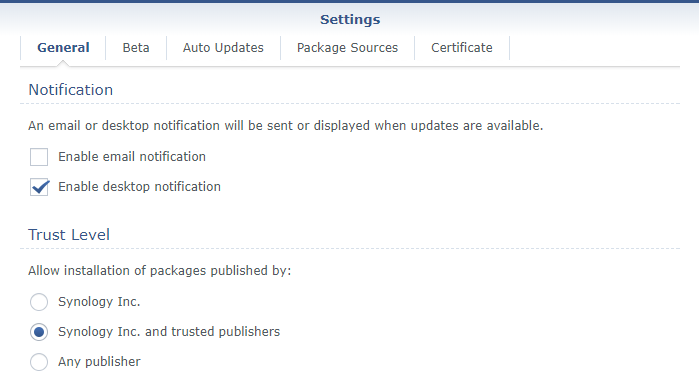 gpg (GnuPG) 2.0.18; Copyright (C) 2011 Free Software Foundation, Inc.
Now that this package is signed, add your certificate into the list of trusted publishers within your Synology's Package Center. Doing so, it will automatically be added as a trusted publisher for anyone who is adding your SSPKS url in his list of "Package Sources". 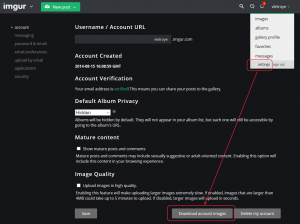 I have been looking for a quite long hour how to download all images from my Imgur account. The solution is damn stupid simple: use the button "Download account images" in the "Settings" page. After updating DSM on my Synology, Plex Media Player was not able to find the Plex Server running there. Possibly do also delete the Plex's Plugin Service as done here. IMO, the problem was that I didn't stop properly Plex Package before updating my DSM. The Plex instance running at that time apparently didn't completely shutdown. But it was not really running fine anymore either. Unfortunately, that instance was preventing a new one to start (as it was still using the port 32400). Install first InkScape and next ConversionSVG. Set the desired "Size" for the output images. Select bellow the target folder to store the converted images.